so close that your eyes close with my dreams. Pablo Neruda is theway to my heart! I'm not into poetry, but that is sooooooooo pretty! Are you sure I won't use some of his stuff for my wedding? Carthartic in all kinds of ways! Now Pablo...let's get to know each other better shall we? I see you're Potterhead. Respect! ...I love you without knowing how, or when, or from where. I like Neruda. My ex introduced me, because he was in love with Neruda. Some of that sensibility seeped into me, but my own poetry awakening was maybe Khalil Gibran. Before that, the Bible. Ah, there were a lot of others. I have a couple of new collections, one of them mentions Neruda actually. Surprised that people dig poetry in this crazy town! BTW, the guy who loved Neruda, he was also mad about: Isabel Allende (got me reading that too), Gabriel Garcia Marquez, and a little Egyptian movie I took him to titled Duniya (Kiss Me Not On The Eyes.) Pretty certain that you'll get goosebumps with all three, though for me they were not life-changing. Yeah, watch Duniya. 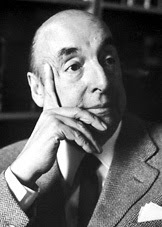 My first boyfriend when I was 10 copied,I Crave Your Mouth, Your Voice, Your Hair and I thought He was God, until I discovered Neruda when I came to the states, I memorized everything by heart. He personifies Love. I remember the first time Neruda captured, i was watching an episode of Girlfriends and Joan recited "i crave your mouth" to her boyfriend. I was amazed, i went to look for it immediatly and fell in love with his poems.